Tiger salamanders (Ambystoma tigrinum) are strikingly beautiful salamanders that are quite popular as pets. They can be quite long lived (some estimate as much as 25 years), large, and usually become quite tame although their sensitive skin means that they should not be handled. Tiger Salamanders have quite a wide range across North America, and although still quite common they are protected in some areas, with their wild populations declining in some areas due to shrinking habitats.It may be illegal to take them from the wild where you live so check with your wildlife department before deciding to keep one. There are several subspecies of tiger salamanders in North America. 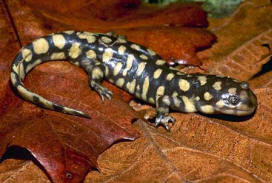 The basic coloration of tiger salamanders is yellow blotches, spots or bars against a black background, although patterns and intensity of color vary between the subspecies. As well, some subspecies have a tendency to exhibit neoteny, breeding in the larval form and never undergoing metamorphosis into the adult terrestrial form. The larval tiger salamanders closely resemble the axolotl (a related salamander that typically reproduces only in the larval form), and are sometimes sold as "water dogs." As mentioned, you must check before collecting larvae from the wild as this may be prohibited in your area. Another potential source is bait shops – the larvae are sold as bait. The larval stage is entirely aquatic, so can be set up in an aquarium with 6 inches of water and some rocks they can hide in. They should be kept at 65-70 F (18-21 C). A good filter is required and aeration with an airstone is recommended. Particular attention must be paid to water quality, especial ammonia buildup and pH of the water. See the article Salamander Housing for more detail on housing. Eventually (may take months to years) the larva will lose its gills and emerge from the water, taking on the adult form. As this occurs, the amount of water in the tank should be gradually reduced and a land area provided. Once metamorphosis is complete the salamander can be kept in a terrestrial tank set up. A substrate suitable for burrowing must be provided. Many owners use potting soil (no vermiculite), peat, and bark chips, or sphagnum moss. Anything that can be kept moist and allow burrowing is fine, so gravel is not appropriate. However, keep in mind that due to their size and healthy appetites, tiger salamanders do produce quite a bit of waste, so their cages will need frequent cleaning. Do not expect to have a permanent or elaborate set up. Plants, bark pieces, rocks or other hiding places should also be provided (multiple hiding spots per cage). Again temperatures of around 65-70 F (18-21 C) are acceptable, but the temperature should not be allowed to increase over 72 F (22 C). A shallow dish of water should also be provided – large but shallow (no more than 1-2 inches deep). Your salamanders might enjoy soaking in the dish, and the water will need regular cleaning too. Heating is typically not required as tiger salamanders should be kept at room temperature or slightly below. The enclosure should not be wet, but the substrate should be slightly damp. When cleaning the tank, use only very hot water and no detergents. Salamanders have extremely sensitive skin and also absorb chemicals readily through their skin. UV lighting is not required, but a regular light-dark cycle mimicking that of the area they are native to should be maintained with incandescent lighting, preferably on a timer. Tiger salamanders have a healthy appetite, and should not be overfed as they will become obese. Larva will take aquatic invertebrates such as Daphnia and brine shrimp, insects, small fish, and worms. The adults can be fed a selection of feeder insects such as crickets, earthworms, and wax worms, a selection of wild caught insects (be sure the area collected from is not sprayed with pesticides) and can be offered the occasional pinkie mouse. Due to their size and strength, they shouldn't be housed with smaller salamanders. Due to the sensitivity and delicate nature of their skin, salamanders should not be handled unless absolutely necessary. The salts and oils present on our skin can harm them, so if handling is necessary (e.g. while cleaning the cage) you should wash your hands well with soap, rinse very well, gently scoop up and fully support the salamanders, and minimize actual handling. Tiger salamanders typically overcome their natural shyness easily and become quite responsive - coming to the sides of the tank when you approach their cage in anticipation of a meal. They are beautiful and rewarding pets, and have few demands beyond a clean cage and varied diet.